Mandi Schwartz’s supporters now have the opportunity to own a unique piece of memorabilia that honors her memory. 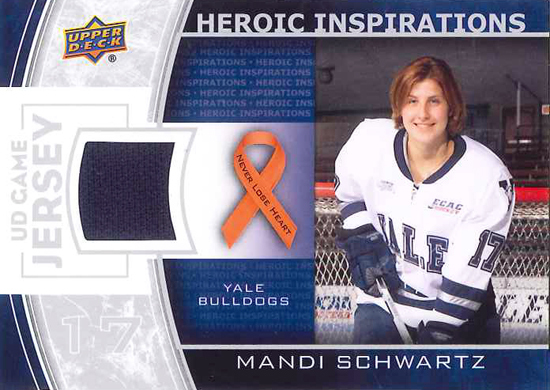 Each Upper Deck Mandi Schwartz “Heroic Inspirations” card contains a piece of one of Mandi’s game-worn Yale jerseys. A limited number of these cards are now available for sale, with all proceeds benefiting the Mandi Schwartz Foundation. To obtain a special edition Mandi Schwartz Heroic Inspirations card, please send a check for $35.00 to The Mandi Schwartz Foundation. Maximum purchase amount is 5 cards. Please include a short note indicating your card purchase, mailing address & email address. Once we receive your payment and note, we will ship the card to you!